Wayne Merrill bought a house on the Baptist Retirement Community (BRC) campus 30 years ago when he began working for the senior living community as its CEO, and he still resides there to this day. He and his wife plan to live there for the remainder of their retirement as well, noting that they love the people who live and work there, they approve of the way the community is run, they like the city and they enjoy the convenience of having most everything they need within the 100-acre campus. Though Merrill is no longer CEO, he is still involved with the community along with other companies and organizations. Currently, he dedicates several hours a week to volunteer with BRC’s auxiliary where he serves as assistant treasurer. The auxiliary is one of the largest in the nation and has its own gift shop. In addition, he serves as executive vice president of West Texas Power, has been serving Hunger Plus as its president for the last 20 years, serves as a Deacon at First Baptist Church and heads up the financial committee for the Silver Haired Legislature. In the midst of all this, he even golfs, goes fishing and spends leisure time with his wife enjoying all the amenities Baptist Retirement Community offers. Though he is 82 years old, he is still a powerhouse and change agent. When Merrill was CEO, BRC had six skilled nursing divisions with 300 licensed beds, 83 single family homes, 104 duplexes, 73 hotel suites and 48 one- and two-bedroom apartments. In the last few years, BRC built Sagecrest Alzheimer’s Care Center, two Green House Homes® and The Crest, which are two memory care assisted living homes modeled after the small home concept. Merrill has witnessed much growth and positive change over the last 30 years. When the focus started shifting from predominantly skilled nursing care, BRC expanded to serve seniors in need of all types of care. 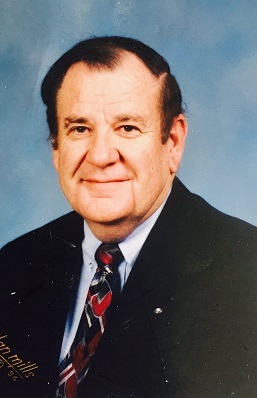 Merrill planned on retiring in 1992, but stayed active both in the workforce and socially because he thrives on leading a productive and meaningful lifestyle. He is proud of the Baptist Retirement Community auxiliary, which is one of the largest auxiliaries in the nation. Currently, they have more than half a million dollars in the bank which they use for expenses that benefit the residents, such as new buses for transportation and new whirlpool tubs for medical therapy. 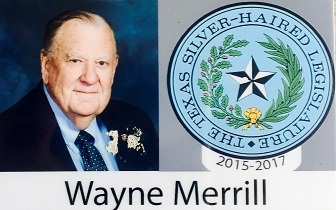 He is also one of 120 individuals who serves on the Texas Silver Haired Legislature in Austin. Each legislature is elected by the people living in each area in the state. He represents the Concho Valley in West Texas. The group is elected by committees in the area and seeks to pass resolutions. During congressional hearings the legislature presents their resolutions. Most recently, Merrill and fellow members pushed for their number one resolution, to discourage texting and driving. Merrill has certainly been living and following his dreams. He has been a true inspiration to his children, all of whom obtained degrees from Texas Tech and went off to lead successful lives. Three of his children still live in San Angelo and Merrill and his wife have nine grandchildren to spoil. They love welcoming all of the family to visit them at Baptist Retirement Community, and eagerly await Thanksgiving as they will be hosting it at their house this year.